Hamlin Lake is just four miles north of Ludington, which is along the route of the Lake Michigan Circle Tour. If you're looking for a fun, inexpensive family vacation, then Hamlin Lake is where you want to be. It offers terrific summer recreation, including swimming, boating, tubing, and fishing. At more than 12 miles long and 5,000 acres large, there's more than enough space for everyone without feeling crowded. This man-made lake originated during the logging hey-day when lumbermen dammed the Big Sable River to make an enormous holding pond for trees felled upstream. Located along the western shore of Hamlin Lake is the Ludington State Park. 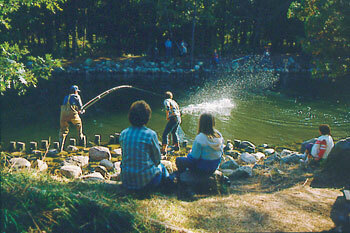 Within the park is the Hamlin Dam, a great spot for catching salmon in the fall. The sandy shoreline of Hamlin Lake Beach is popular with swimmers and sunbathers. It features picnic lawns, concession stands, and restrooms. From here you can begin your walk on a hiking path, or rent a canoe or kayak and take a leisurely glide on marked paths that meander along the state park's shoreline. Hamlin Lake touches the Manistee National Forest on the north, towering dunes in the west and miles of undeveloped wilderness all around. The eastern shoreline of Hamlin Lake is filled with family-friendly resorts and cottages...many with marinas where you can launch your boat or rent one for the day. Read our story to learn about the history of Hamlin Lake. The northern shore of Lower Hamlin Lake is comprised of beautiful sand dunes. It's a great place to anchor your boat just off shore and enjoy sunning or sandy-bottom swimming. Climb the dunes for a magnificent view of Hamlin Lake and Lake Michigan. Just to the west of the dunes, you can land your boat at the shoreline and follow a trail into the Ludington State Park and the Hamlin Lake dam. The fishing is great on Hamlin Lake! Whether you traverse the bayous or head for deeper waters, Hamlin Lake offers a smorgasbord of fish. Tiger muskie, northern pike, large and small mouth bass, perch, crappie, bluegill and over 600,000 walleye, planted several years ago, promise a superb catch. The fishing doesn't cool down in winter either. 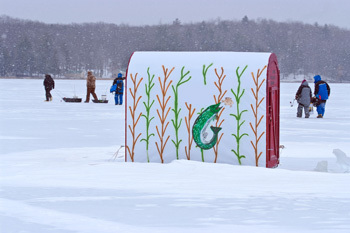 Tip-ups and shanties dot the ice as fishermen pull in delicious panfish and walleye. Hamlin Lake is a wonderful destination during the warmer months, but winter is beautiful as well. During the winter, ice-shanties are scattered on the frozen lake and you can participate in a local ice-fishing tournament. Winter also means ice-skating and cross-country skiing on miles of groomed trails along Hamlin Lake and through Ludington State Park's frozen wilderness, truly making Hamlin a lake for all seasons. Any season--any time--Hamlin Lake is where you want to be. We have listed our area events in our festivals & events story so you can see at a glance what's happening when. You can get event details by checking our calendar of events pages and selecting a specific month. There's always something fun going on, no matter what time of year. You'll never be bored around Hamlin Lake! Explore HamlinLake.com for more information! Friendly Businesses to Serve You! When you visit a community away from home, it's typical to find yourself eating out, shopping, or looking for things to do. Hamlin Lake merchants are happy to serve you with a smile! So, take some time and discover the many businesses ready to entertain you, or to provide you with a variety of services.